I thought I would upload an older freehand painting I did from a John Juno Acrylic painting. Mine was created with sharpie black and brown markers, His was with paint. He is a great artist and I love his style and his body of work. I drew this just to see if I could, I just looked at the painting online and drew it out on paper with no tracing or printing of the original. I still am surprised how well it turned out. I named my version "Gaag" (porcupine in OJibwe). The second photo is my version. 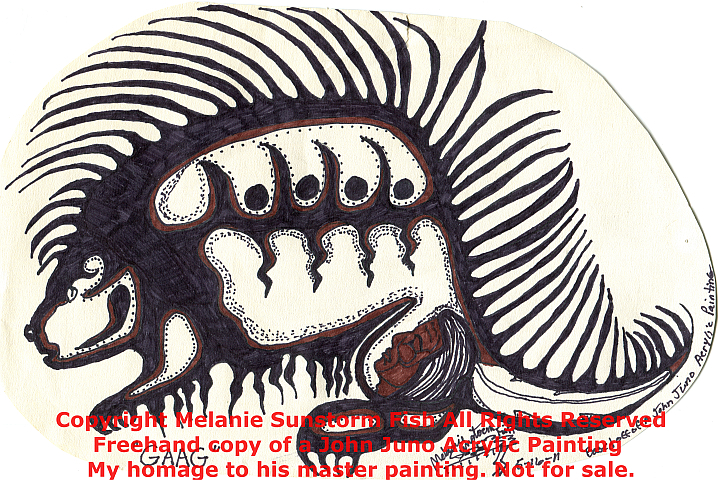 "Gaag" Sharpie on Sketchpaper (Not For Sale) Homage to John Juno's original Painting entitled "Porcupine"